Zaha Hadid's residential tower on West 28th Street and the High Line. It’s been six years since I launched Barbara A. Campagna/Architecture + Planning, PLLC and while many things have changed, my goal to work on “greening what’s already here” continues to be met, often in places I never expected. Many people are finding new ways to integrate historic preservation and green building practices, which makes my new venture a delightful and intellectually inspiring one. This is blog four of my anniversary week. It’s hard to believe I haven’t been to NYC in six months. After the usual travel chaos I made it to Manhattan around 3:30, staying in midtown to be near the Penn Club where our Columbia GSAPP board meeting is (Graduate School of Architecture Planning & Preservation). A walk around my former FIT neighborhood led me to the High Line, the 2009 ground breaking park created from the bones of the abandoned West Side Line, an elevated spur of the New York Central Railroad. 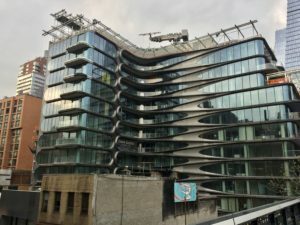 The High Line has gotten a lot of criticism for being too nice basically – it gentrified a very scrappy neighborhood and has become one of the biggest visitor attractions in NY. It is good to ignore all of this at times and just enjoy it for what it is, an inspiring and innovative reuse project. I checked in on all the starchitects’ buildings, enjoyed the latest sculpture and even found a bench to sit on for a while. In some respects this linear park is also a linear art and architecture museum. For a more photos, please view my Facebook photo album - You don’t need to be on Facebook to view it. (And I apologize for the wonky formatting; I'm in the middle of renovating my website.) And if you’d like to “subscribe” or follow my blog, True Green Cities, please sign up through the “Subscribe” button at the bottom left of this page. You’ll receive a daily recap when new blogs are posted. Or Sign up for the Feed, also at the bottom left of this page.